My cats have allergic asthma and conventional cat food and kibbles just make them cough, except feline instincts. 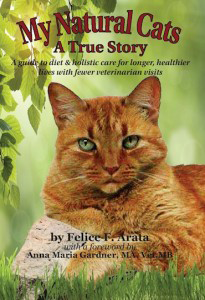 I have no problem introducing raw diet to them by following Felice’s recommendation by adding some chicken liver powder or tuna on it at the beginning for about 1-2 weeks. They love the chicken liver powder and I think it smells delicious. 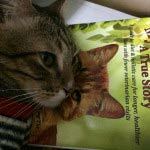 My Natural Cat A True Story has a lot of great information and little known facts such as Biospy cause cancer to spread even faster, ways to administer herbs to our cats so that they do not vomit and a lot more. This has become a first-aid handbook to me.